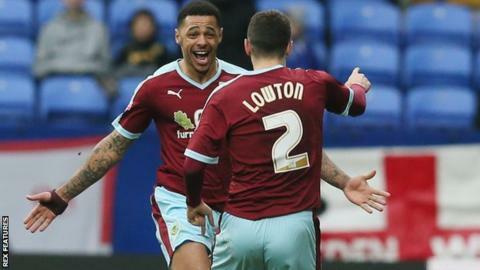 It was another dramatic day in the Football League on Saturday as Burnley came from behind at Bolton to go top of the Championship. "The worst thing I've seen in football"
The words of Braintree manager Dan Cowley after his side's 1-1 draw at Guiseley in the National League. So why was Cowley so unhappy? Lions midfielder Ollie Norburn accidentally scored from long range when giving the ball back to Braintree goalkeeper Tom King after an injury to an Iron player when the visitors were leading 1-0. Braintree expected to be allowed to walk a goal in - but the Lions had no such intentions. Guiseley boss Mark Bower told BBC Radio Leeds: "The goalkeeper stood there with his arms in the air and allowed the ball to go in to the net. "It put us in a really difficult position whether we should allow them to score or not, but everyone around us was saying the keeper was trying to be clever and had let it go in. "It all kicked off and it was unpleasant and I'm sure it will attract some attention. It's a very uncomfortable position to be in." The match at Nethermoor finished 1-1. In National League South there were even uglier scenes at Ebbsfleet v Hayes & Yeading, where it finished nine aside. Four players were sent off following a melee early in the second half, with Tom Bonner and Anthony Cook going for league leaders Fleet and Emmanuel Monthe and Adam Everitt seeing red for the visitors. The red cards did not have much of an impact on the eventual outcome though, it finished 0-0. Reading striker Yann Kermorgant pulled no punches when he was asked about his exit from Charlton in January 2014. "I wanted to sign a new deal and stay longer at the club," said the 34-year-old Frenchman. "In my first meeting with the new owners I found out things were completely different. They had a vision which, for me, was completely deluded." It seems the veteran forward's instincts were pretty shrewd as the Addicks now face relegation from the Championship amidst fan protests against Belgian owner Roland Duchatelet. Kermorgant said he was "gutted" by what had happened to the club since his departure - but it seems he left his sentimental feeling for his former employers off the pitch. He scored twice in the opening 35 minutes as the Royals eventually secured a dramatic 4-3 win, despite a hat-trick for Arsenal loanee Yaya Sanogo. Wigan chairman David Sharpe did not do much to endear himself to his side's League One rivals when he predicted the Latics would not only secure promotion this season, but would "smash" the division. The 24-year-old even said he wanted his team to get 100 points. When Gary Caldwell's men picked up just 10 points from their opening seven games it looked like Sharpe's words might come back to haunt him. However, the 2013 FA Cup winners have turned their season around in style and Saturday's 3-0 hammering of neighbours Bury means they're now on 62 points from 33 games. When Grant Holt scored his second of the game in Rochdale's 4-3 win over Shrewsbury in November 2005 Dale fans probably did not think they would need to wait over 10 years for his next Spotland goal. The 34-year-old had not scored for anyone since a goal for the Terriers in November 2014, so he will have been as delighted as any Dale fan after coming off the bench at half-time to make it 2-0 against Sheffield United on Saturday. Rochdale manager Keith Hill told BBC Radio Manchester: "Holty's come in and he's done exceptionally well in training and he's done well in the games when he's come on. "His game management was terrific. He's played in the Premier League and the way he managed their defenders was superb." It was 19 December when Northampton Town fans last turned up to see their team play a League Two game and left having not seen them win. The Cobblers, who top the table by an impressive 10 points, had won their last 10 league games before journeying north to play struggling Hartlepool. Pools clearly had not read the script though and put in a great display to earn a 0-0 draw that means they remain two points clear of the relegation zone. "You have to give Hartlepool a load of credit," Cobblers boss Chris Wilder told BBC Radio Northampton. "I said to the players after the game that records come and go, our job is to win games and accumulate points. The players are disappointed and that is a good quality to have." The result also means the Football League record of 14 successive victories, which has stood since 1905 and is shared between four different teams, remains intact. But can you name the four?